We know that controlled burns are done to protect people but some endangered species depend on those flames to survive. 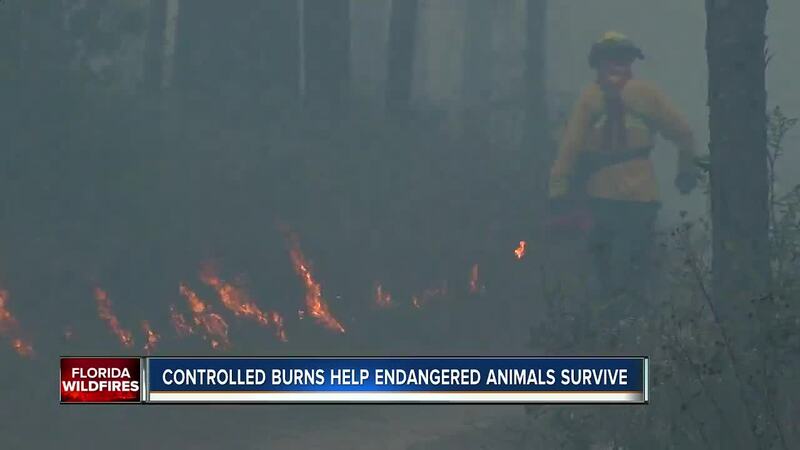 HERNANDO COUNTY, Fla. — We know that controlled burns are done to protect people, but some endangered species depend on those flames to survive. Wildfires are a concern, especially when you live in the lightning capital of North America. "Once a fire is caused by lightning, it would’ve burned across the entire county," said Vincent Morris of the Florida Forest Service. The Florida Forest Service does controlled burns like the ones being done at the Withlacoochee State Forest this week, that will protect it from wildfires for up to seven years. But controlled burns don’t just help protect the forest from wildfires, they protect endangered species that depend on those flames to survive. Burning away dead vegetation is important because wildlife and endangered species like the red-cockaded woodpecker and gopher tortoises depend on fires to burn away what’s dead so new vegetation can grow. The Withlacoochee State Forest has one of highest gopher tortoise populations in the nation, and the federally protected red-cockaded woodpecker went from a single-digit population in the forest to now 100. The forest service says it's thanks to controlled burns that are necessary to maintain habitat for us, and them.